Here are some common Japanese food descriptions that will help you dine in Japan with more ease. 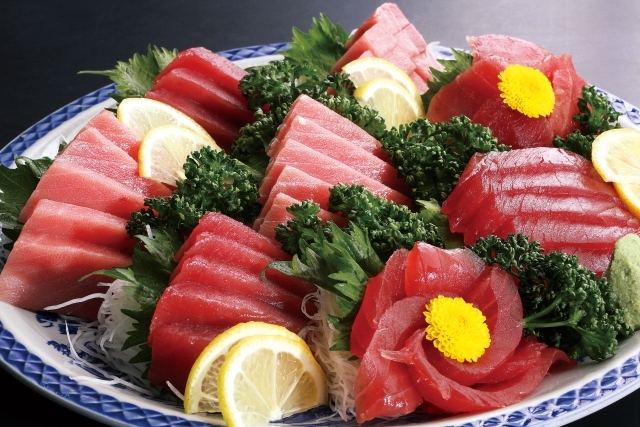 Sashimi (刺身) is raw fish served only with soy sauce and wasabi (Japanese horseradish). Sushi (寿司) is raw fish, vegetables or other items served with vinegar-seasoned rice, often in bite-size pieces, like the popular “nigiri” (握り, meaning “grip”) – fish pressed by hand onto vinegared rice. Other varieties include “makimono” (巻物) – fish rolled in rice and nori (海苔, paper-like seaweed), “oshizushi” (押し寿司) where the rice and fish are pressed into a mold before being cut into pieces, and “chirashizushi” (チラシ寿司) where a selection of sashimi is presented together in a bowl of sushi rice. 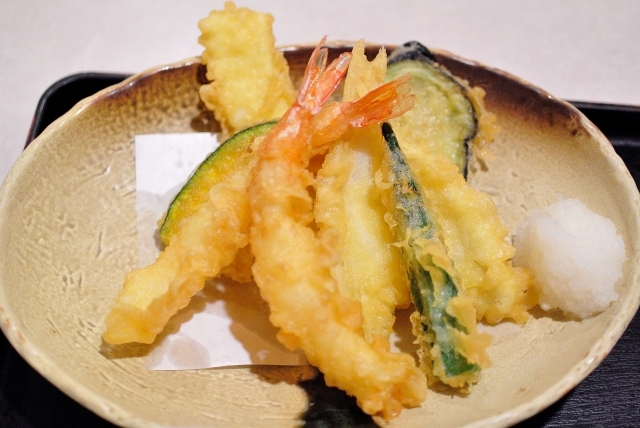 Tempura (天ぷら) is seafood and seasonal vegetables deep fried in a light batter. The most common seafood tempura varieties are ebi (エビ), kisu (キス, Japanese whiting), anago (アナゴ, saltwater eel) and ika (イカ, squid). Vegetable versions include nasu (ナス, eggplant), kabocha (カボチャ, Japanese pumpkin/squash) and renkon (レンコン, lotus root). It takes a skilled chef to prepare the best tempura, and is best when fresh. Tempura is used as a variation for many other dishes, including soba, udon and donburi (see below). Tonkatsu (トンカツ) is a localized version of an imported dish from the West. Made from pork cutlets coated with egg and breadcrumbs and deep fried. The menu at tonkatsu restaurants will typically have a variety of meat cuts available. Pork loin, “rōsu” (ロース) will appear as rōsukatsu, while pork fillet, “hire” (ヒレ）will appear as hirekatsu. Tonkatsu served with karashi (辛子, Japanese mustard), and tonkatsu sauce (similar to Worcestershire sauce) to add extra flavor. Tonkatsu is a common topping for Japanese curry, and is even sold on sandwiches, known as “katsu-sando” (カツサンド). Karaage (唐揚げ, deep-fried chicken) differs slightly from western fried chicken in taste and texture. The chicken is marinated in soy sauce and ginger before deep-frying in a manner similar to tempura. Yakitori (焼き鳥) is skewered meat and vegetables cooked over a grill. The most common yakitori meat is taken from the breast and thigh of the chicken, but internal organs (offal) including heart, gizzard, and liver are also common, as is nankotsu (軟骨, cartilage). You can choose whether you want it cooked with salt (“shio”) or sweet soy sauce (“tare”). It tastes particularly good with beer or sake (“nihonshū”). 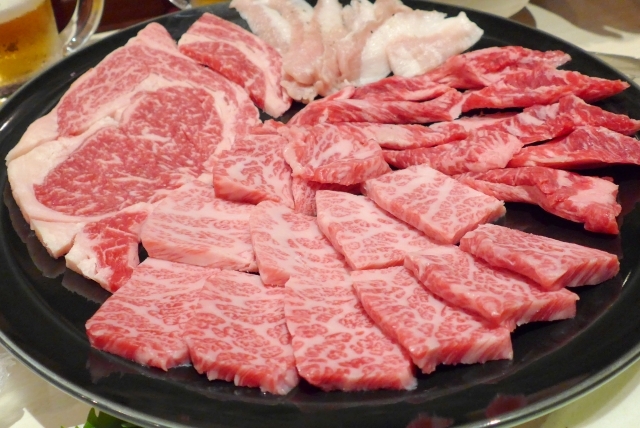 Yakiniku (焼き肉, barbecued meat) found its way to Japan from Korea. At yakiniku restaurants, tables are usually fitted with a barbecue grill at the centre that is lit by the wait staff. Platters of meat (usually beef and pork) and vegetables are ordered and placed on the grill until cooked, when they are usually dipped in yakiniku sauce and eaten. Beer is a common accompaniment to yakiniku, and some restaurants offer all-you-can-drink courses. In Hokkaido, a variation known as Jingisukan (ジンギスカン, from “Ghenghis Khan”) is popular and has spread to other parts of Japan. Jingisukan restaurants specialise in lamb, which is cooked over a greased convex grill. The smell of the cooking meat at yakiniku restaurants can easily stick to clothes, and some restaurants provide bibs for diners. Nabe (鍋) are “hot pot” style dishes with meat, vegetables and sometimes tofu and other ingredients cooked together in one pot. In the home, nabe is often cooked at the dinner table on a portable gas stove and is commonly consumed in winter. 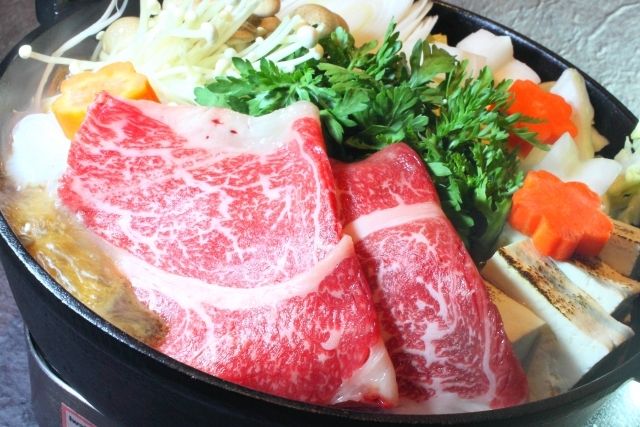 There are many nabe restaurants that specialise in the more traditional varieties, while supermarkets often sell more recent variations to prepare at home. Shabu-Shabu (しゃぶしゃぶ) is a type of nabe where thin slices of meat are cooked by lightly dipping them in a pot of boiling konbu (kelp) stock. They are then dipped into in ponzu (ポン酢, citrus flavored soy sauce) or goma-dare (ごまだれ，sesame sauce). 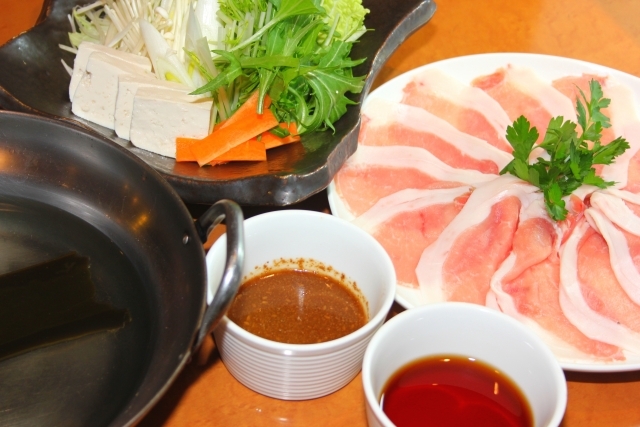 Beef is the most common meat used in shabu-shabu, though pork is not unusual. There are several other varieties less commonly seen, including chicken, crab and lobster. Sukiyaki (すき焼き) is a type of nabe where thinly sliced beef is slowly simmered in a sauce made from soy sauce, sugar, sake and mirin (a type of rice wine), together with vegetables and other ingredients such as tofu. Items are taken from the pot when cooked and typically dipped in raw egg before eating. Chankonabe (ちゃんこ鍋) is a type of nabe commonly consumed in large quantities by sumo wrestlers in order to gain weight. The broth is generally chicken based, to which high-protein ingredients such as meat and tofu are added along with vegetables. Okonomiyaki (お好み焼き) is a savoury omelette-style dish, often prepared by the customer on a teppan (鉄板, hot plate). A batter of flour and eggs is mixed with cabbage and other ingredients, such as meat (pork being the most common), seafood and vegetables. When cooked, okonomiyaki may be topped with a brown okonomiyaki sauce, powdered seaweed and katsuobushi (鰹節, shaved dried bonito). In Osaka, where the dish originated, the ingredients are mixed together, while in Hiroshima they are layered and noodles are often added. Monjayaki (もんじゃ焼き) is a Tokyo variant of Okonomiyaki with a much softer consistency. Healthy Soba (そば, buckwheat) noodles can be served cold with dipping sauce or with hot soup. Cold soba is generally very healthy, and topped with ingredients such as seaweed, daikon (大根, Japanese radish), okra and nattō (納豆, fermented soy beans). Hot soba is served with a wide variety of toppings including seaweed, tempura, meat, abura-age (油揚げ, deep-fried tofu), raw egg and vegetables. Udon (うどん) is the Japanese term for thick, wheat-based noodles that is most often served in hot, soy-based soup. It is commonly topped with anything from seaweed and tempura to deep-fried tofu and curry sauce. Originally from China, ramen (ラーメン or 中華そば, chūkasoba, meaning “Chinese noodles”) has become a staple of Japanese fast food. Noodles are served in a broth, the most common varieties of which are salt, soy sauce, pork bone and miso-based. There are many regional variations, and people will travel long distances to eat at the most popular shops, standing in long lines to get in. Donburi (丼, bowl) refers to a range of Japanese dishes where toppings are served on a bowl of rice. The original iteration is gyūdon (牛丼, beef bowl) a dish of rice topped with thinly sliced stewed beef and onion. Gyūden can be considered the original Japanese “fast-food”, and its popularity has led to the creation of many other donburi (丼, bowl) dishes, including tendon (天丼, rice topped with tempura), unadon (鰻丼, rice topped with freshwater eel) and oyakodon (親子丼, rice topped with egg and chicken). 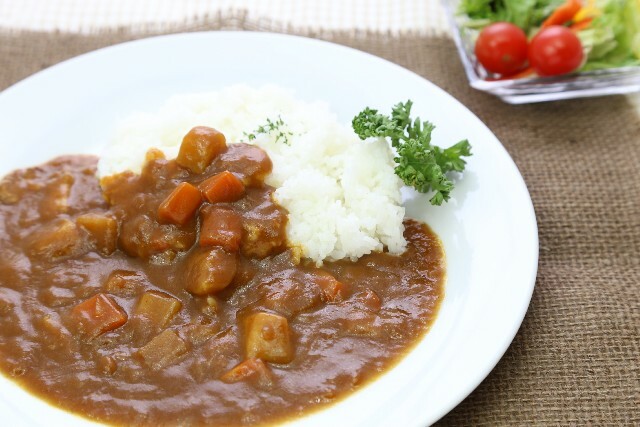 Japanese curry (カレー) has its own distinctive flavour and texture. Commonly prepared at home from a roux, any additional ingredients (such as meat and vegetables) are down to personal preference. At restaurants and Japanese fast food chains, curry often comes with a number of topping options, including katsu (chicken or pork cutlet), egg, seafood and cheese, and customers may have the option of choosing the spice level. 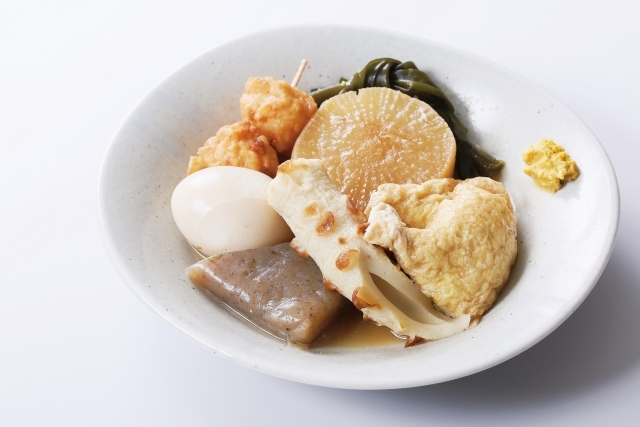 This Oden (おでん) is a broth-based dish eaten mostly in winter. The ingredients include eggs, daikon (Japanese radish) and processed fish cakes, though the recipe varies widely between regions and households. During the winter period, convenience stores often have oden stands by the counter. Freshwater eels, not to be confused with Anago (穴子, saltwater eels). Unagi (鰻) are grilled with a distinctive sweet soy sauce and served on a bed of rice. Preparation methods vary by region. In Kanto, unagi is steamed before grilling. It is very nutritious and is popularly known for restoring stamina during the hottest days of summer. Fugu (ふぐ, puffer fish) can be lethally poisonous if prepared incorrectly, so only specially licensed chefs are allowed to prepare it. 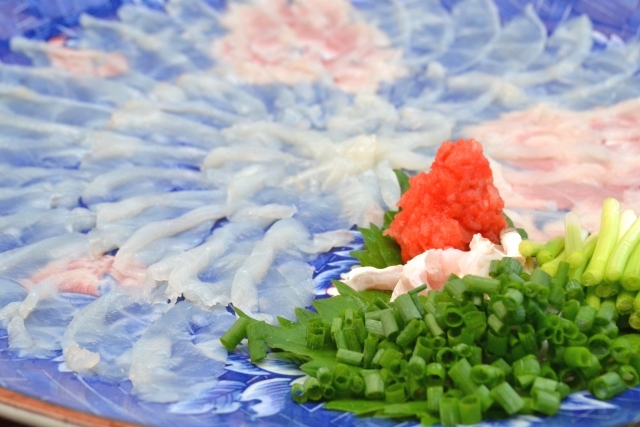 Many people enjoy eating it raw as sashimi or cooked in a hot pot.